This soup is light, delicious, but packed with nutritional value. Unfortunately you don’t get the toast! Our client’s like it so much they ask for the recipe so they can make it at home for their friends and family. It is so quick and easy – tastes great and is so good for you. Ideal for your weight loss/maintenance program. Place olive oil in a saucepan and heat – add sliced onion and cook until softened and turning brown. It will take approx 5 minutes, but keep stirring and watch to avoid burning. Then add the garlic and stir for 30 seconds. 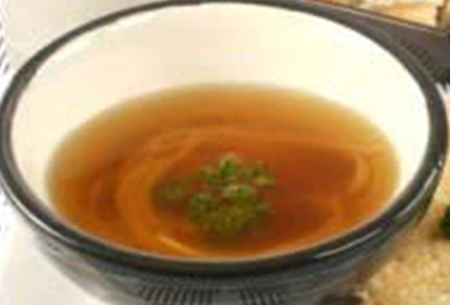 Pour in 4 cups of boiling water, tamari and stock powder. Simmer for 20-30 minutes. The liquid will reduce so you may need to add a little more hot water before straining out two thirds of the onions. If you leave all the onion in the soup it may cause gas and discomfort. Strain and serve sprinkled with parsley. Makes 2-3 bowls. It is suitable for freezing – stores well.